Heroin is one of the most addictive opiate drugs in existence and has recently experienced a surge in popularity. 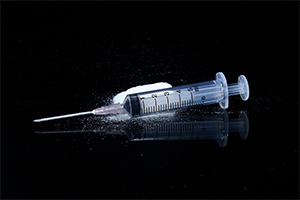 Previously, heroin was only available in injectable form; however heroin users today can snort or smoke heroin, which has increased its accessibility and popularity. Heroin is highly addictive and can often lead to overdose and death. Heroin is one of the most difficult drugs to stop using and many of those who do stop experience extreme withdrawal symptoms. As a result, heroin is a controlled substance and those who are caught possessing or selling heroin can face serious drug charges. If you or a loved one has been charged with a heroin crime, it is very important to hire an experienced heroin defense attorney in Los Angeles. An individual found to be in possession of a personal amount of heroin can be charged with possession under California Health and Safety Code Section 11350 HSC. This crime used to be a felony; however the recently passed Proposition 47 reduced possessing personal amounts of drugs to a misdemeanor in most cases. This offense applies not only to heroin, but also to cocaine, LSD, certain unauthorized prescription drugs and other controlled substances. For many users, the Court may entertain alternatives to sentencing such as drug diversion programs offered under Proposition 36 or Penal Code Section 1000 PC. Those who are convicted can face up to a year in jail and extensive court fines. Under California Health and Safety Code Section 11351 HSC, possessing heroin for sale is a felony level offense. Those convicted of this crime can be sentenced to serve up to four years in prison. The defendant can be sentenced to an additional three to twenty-five years if found in possession of one or more kilogram of heroin. Police and prosecutors will often look for evidence that that the defendant intended to sell the heroin, including the amount of heroin discovered, the presence of packaging indicative of drug sales, and the presence of items such as scales and large amounts of cash. Engaging in the sale of heroin is an even more serious offense and those caught selling or transporting heroin can be charged with a felony under California Health and Safety Code Section 11352 HSC. Those who are convicted can be sentenced to up to five years in prison. If the defendant transported heroin over two counties, the maximum term of imprisonment is nine years. Heroin users are often found with drug paraphernalia, such as needles or burnt spoons. Under California Health and Safety Code Section 11364 HSC, possessing drug paraphernalia is a misdemeanor level offense and those convicted can be sentenced to up to a year in jail. There may be several defenses applicable to a defendant who is charged with a heroin-related crime. In many cases, the heroin may have been found during an illegal search of the defendant’s residence, vehicle or person. In these cases it may be necessary to file a motion to suppress with the court challenging the legality of the search and seizure. If granted, all resulting evidence will be suppressed and the case will likely be dismissed. In some cases heroin is discovered during a search pursuant to a search warrant. If the warrant was deficient or relied on false information in the affidavit, there may be grounds to have the warrant invalidated and the resulting evidence suppressed. If you or a loved one has been charged with a heroin offense, it is critical that you discuss your situation with an experienced criminal defense attorney who handles drug cases. As a former Deputy District Attorney with over 14 years of prosecutorial experience, Michael Kraut is highly regarded throughout the court system as a skilled litigator who understands how to effectively fight allegations of heroin sales and possession. For more information about heroin and heroin-related criminal offenses, and to schedule your free consultation, contact Michael Kraut at the Kraut Law Group located at 6255 Sunset Boulevard, Suite 1480, Los Angeles, CA 90028. Mr. Kraut can be reached 24/7 at 888-334-6344 or 323-464-6453.